This product comes with a 5-inch display, a Color-TFT screen, and GPS. The sonar on this unit is great; it offers accurate readings even in deep waters (up to 1500 feet). Another good thing about this unit is the integrated GPS. It helps you to mark waypoints and come back to the same spot later. It features the DualBeam and SwitchFire technologies which provide accurate data and exceptional readings. 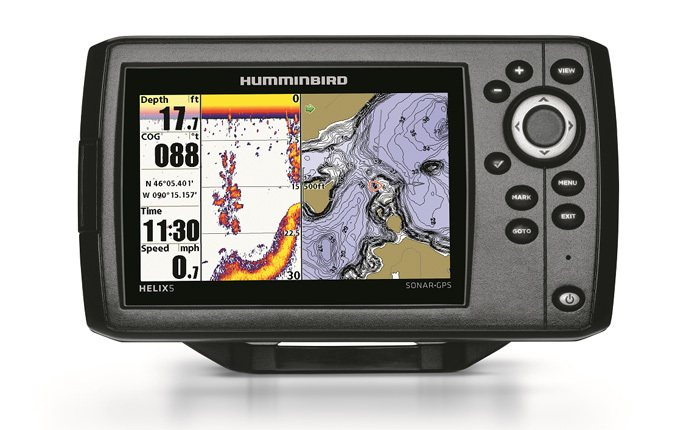 Humminbird has released their new HELIX Series in late March 2016. This series has a lot of new technology integrated into it and offers impressive readings and visual representations. The screen is a 5-inch 256-color Color TFT, and it has a resolution of 800 x 480-pixels. The combination of these parameters offers an optimal quality of the picture and exceptionally accurate readings from below the surface. Humminbird is well-known for making good and affordable fish finders, and they didn’t disappoint at all. This fish finder is one of the rare models with GPS integrated for such affordable price. Even people with low budget can consider opting for this model, just because it has GPS included. In this review, we will take a look at some technical specifications and the technologies included with this fish finder. The standard 5-inch display is optimal for 800 x 480-pixels resolution. The picture is top-quality. Also, thanks to the new technology integrated into the new DualBeamPlus Sonar, you can easily distinguish bait, fish, terrain, rocks, and other. The LED backlight is adjustable thus allowing you to change it during the day as well as by night. 256-color pallet offers a clear insight of what’s going on below the deck. Colored displays are a great commodity because they providemore precise readings and images. Having GPS can help you in many ways. For example, you can mark individual fishing hotspots and make waypoints so you can return at any time. Also, if you’re fishing in unfamiliar waters, it’s easy to get lost. With GPS you have satellites constantly monitoring your position, so you can never get lost. Although GPS service adds up to the overall price of the product, this fish finder remains affordable even with GPS integrated. With GPS you can also track your movement and your speed, it comes in handy is you want to investigate the circulation and migration of fish. This product emits 200 kHz on 20 degrees of sonar coverage and 83 kHz on 60 degrees of coverage. If you set the frequency to maximum, more energy will be directed to a narrower area. Both frequencies can distinguish the soil, bait, fish, and other objects. Using higher frequencies in shallow water will result in a better picture and a more accurate reading. DualBeamPlus Sonar operates flawlessly and detects particular objects with ease. The split screen comes as a great commodity because you can do multiple things at once. For instance, you can mark your waypoints through the GPS system while scanning the bottom with your sonar. Multiple window technology offers incredible benefits. Also, this option allows you to zoom in on one side of the screen while watching the original version on the other end of the screen. 3D Chart View will allow you to review the captures in 3D technology. The DualBeam Plus technology is integrated into this fish finder. It offers great improvements. In combination with SwitchFire technology it provides accurate readings and precise data. Two modes are available with SwitchFire technology. The Clear mode allows the user to see through rough water. It’s especially effective with fast waters, like rivers. With the help of this mode, you can eliminate the unnecessary clutter in the water. The other mode is Max mode. This mode allows you to see the situation below the deck in incredible detail. It detects and identifies various objects like rocks, fish, bait, terrain, and so on. With this sonar and GPS combined, you can mark up to 2500 waypoints. This product comes with a reasonably affordable price for people with an average budget. The quality of production is impressive; everything is made by experts. The important thing is that the installation of this fish finder isn’t complicated and hard. It’s a pretty straightforward device with valuable and quality hardware. You can rely on this fish finder almost any time you want to go out fishing. Humminbird is a well-respected company, and they’re among the top companies in the business. So, that being said, Humminbird won’t let you down, they invest a lot in the quality of production. This fish finder is a perfect solution for individuals who have a somewhat low budget but want a particular commodity, like GPS. This fish finder is a smart choice, whether you’re a fishing enthusiast or not. The performances are solid. It’s well-made, and it guarantees accurate readings and an excellent quality of the picture. Remember, the greater the resolution, the better the quality, and this fish finder has an impressive resolution. The latest technology integrated into the sonar offers a lot of quality performances in the form of a clear visual presentation of the terrain below the vessel. The main thing you should pay attention to is the GPS feature. Although it’s not a necessity, it’s quite valuable, especially if you’re fishing in the unknown water. The possibility of getting lost is not a pleasant thought. With the GPS by your side, you’ll always have an insight on your movement.